Sorry, I don’t have a good image of the roasted butternut squash, just believe me, it was there and I roasted it. Also, it’s very apparent that I really need to replace my one burnt out light above my stove top. Buying an appliance bulb tomorrow, I think, because one light bulb there just isn’t enough for good pictures. Oh yeah, so cooking it this way (lid askew, stirring occasionally), was not actually one of the ways to cook millet that was discussed in class. But, you know, I like to live dangerously and it seemed to work out pretty well. 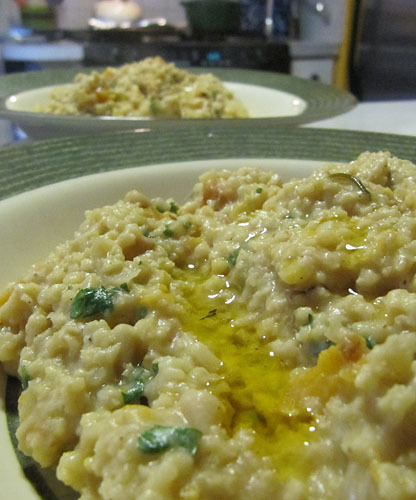 I’m calling it for this is an okay way to cook millet! Preheat the oven to 425 degrees F. Spread the butternut squash out on a baking sheet and drizzle with a little olive oil and sprinkle with a little salt and pepper. Roast until soft, and a little golden in places, about 20-30 minutes. Set aside. In a pot, heat the olive oil and saute the leeks and shallot until soft, about 4-5 minutes. Add the garlic and sage and saute for another minute or two. Add the millet and cook until slightly toasted. About 3-5 minutes. Add the wine and let it absorb for a minute or two, then add all the chicken broth. Stir and lower the heat so it’s only lightly boiling. 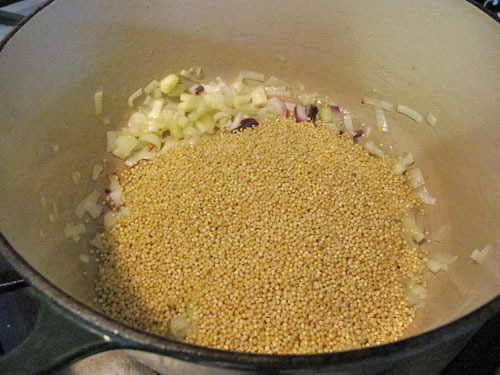 Crack the lid over the top and stir occasionally, until most of the broth is absorbed and the millet is tender, about 20-30 minutes (depending on how soft you like your millet). 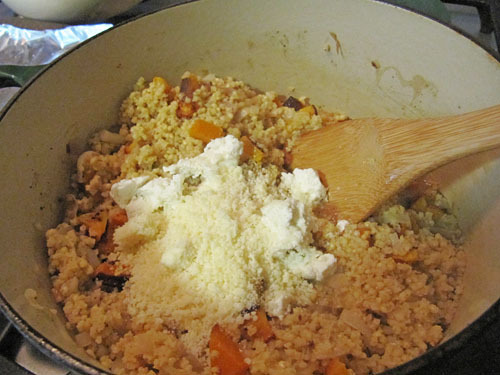 Add the roasted butternut squash and then the cheeses. Stir it all together, it should be pretty creamy. If it’s too creamy, you can always add a splash more broth. 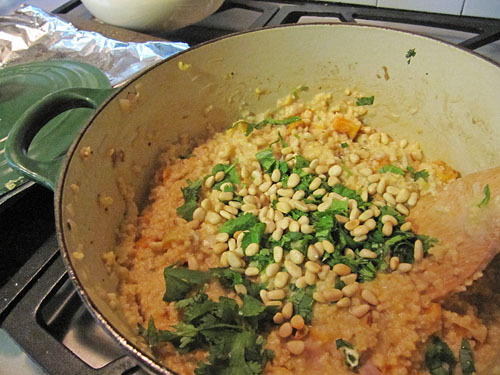 Add the parsley (or cilantro) and pine nuts and mix it all together and add salt and pepper to taste. Serve drizzled with a little olive oil. You may be tempted to serve with more Parmesan cheese too, but honestly, you probably won’t even need it! But if you want to, it’s okay. Just a little note to say thank you for turning us on to the wonders of millet. 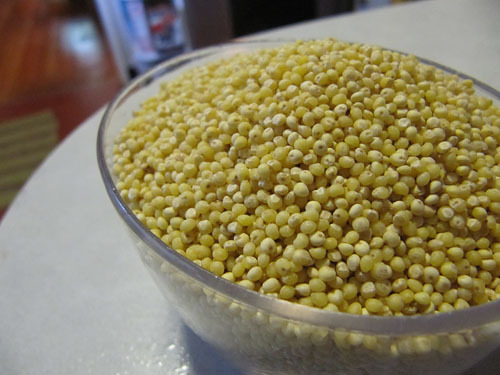 My husband is very resistant to alternative grains (can’t stand quinoa) but we both adore millet. I like it as a change from oatmeal and cooked just like rice and then fried until you get delicious crusty bits. I’m thinking using the flour for breading would be delicious. Happy Thanksgiving. 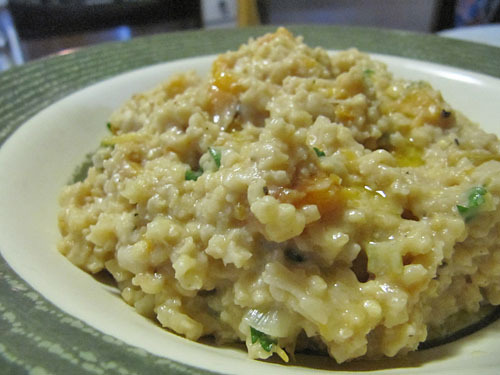 Hi Sam: I used Bob’s Red Mill Hulled Millet.